Saint John, New Brunswick is a port city that Irish immigrants have used since the 18th century as a gateway to North America. Located on the Atlantic seaboard, it provides for easy access to a wide range of Canadian and American locations. During The Famine, thousands of Irish immigrants arrived at Saint John. Tracing Famine arrivals is difficult at the best of time so it is great to have Irish Emigration to New England through the Port of Saint John, New Brunswick, Canada, 1841 to 1849 to assist research efforts. First published in 1996 (then re-published in 1997 and 2004) and written by Daniel Johnson, it is a compendium of extracts from the records of various institutions in Saint John County, New Brunswick. They include hospitals, asylums and workhouses, along with information gleaned from the journeys of the immigrants, their receiving of outdoor relief, and where they might have lived or temporarily resided in Saint John County. Interesting examples abound in the publication. Names derived from a "Catalogue of immigrants from the United Kingdom relieved on parish poor accounts and not charged to the immigrant account year 1842," a document at the Provincial Archives of New Brunswick, are accompanied by Irish counties of nativity. Patrick May, 58, from County Kilkenny, [condition] sick and asmatick [sic]; William Freil, 76, from County Donegal, blind and feeble; and Barbara Ford, 47, from County Leitrim, dropsical [sic], are just three examples. Records for the year 1841 in the temporary lunatic asylum also have detailed information. Catherine Coyle, 33, and John Clougher, 26, both from County Roscommon, were two of the people admitted on 1 May 1841. Mary was discharged five months later but John was still there in 1844. It is often forgotten that Canadian ports were used to immigrate when the final destination was in the United States, hence the name of the publication. Therefore, don't discount this important work if you are researching Famine immigrants in Massachusetts, Vermont or elsewhere in New England. 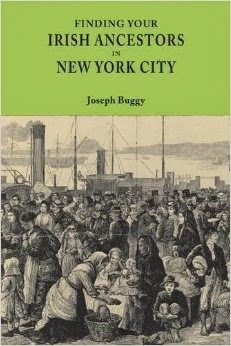 The book is also available in digitized format via the database 'Irish Emigration to New England through the Port of Saint John, New Brunswick, Canada, 1841 to 1849' on Ancestry. Click here for a long list of other sources to do with New Brunswick that I have written about. Johnson Daniel F. Irish Emigration to New England through the Port of Saint John, New Brunswick, Canada, 1841 to 1849. Genealogical Publishing Company: Baltimore, Maryland. pp. 15-16; digital image, Irish Emigration to New England through the Port of Saint John, New Brunswick, Canada, 1841 to 1849," Ancestry (http://www.ancestry.com), accessed 3 December 2016. Johnson Daniel F. Irish Emigration to New England through the Port of Saint John, New Brunswick, Canada, 1841 to 1849. Genealogical Publishing Company: Baltimore, Maryland. p. 13; digital image, Irish Emigration to New England through the Port of Saint John, New Brunswick, Canada, 1841 to 1849," Ancestry (http://www.ancestry.com), accessed 3 December 2016.